"JFK," a documentary, airs on Monday and Tuesday night on KERA-TV, Channel 13. With the benefit of newly opened archives and recently released documents, the film re-evaluates JFK's strengths and weaknesses in the Oval Office and looks at how he navigated some of the most explosive events of the mid-20th century: the Cuban missile crisis, the escalating conflict in Southeast Asia, and the urgent demands of an increasingly impatient civil rights movement. It also provides new insights into his private life -- his relationship with his beautiful, accomplished wife, his obsessive womanizing, his inappropriate friendships, his reliance on his younger brothers, and his deference to the all-powerful father who had helped make him who he was. Mark Samels and Susan Bellows, who worked on the documentary, talked about JFK on a recent edition of ‘Think’ on KERA 90.1 FM. Jack was educated at private schools, Jack didn’t care for authority and wasn’t the best student. At Choate, a boys' preparatory academy, Kennedy became a magnet for troublemakers. Untidy and rebellious, he made a distinctly negative impression on the Choate faculty. He consistently earned mediocre grades. His father worried that he might never reach his potential. By early 1940, when Jack began his last semester at Harvard, most of Europe had been crushed by the Nazi war machine, and Britain lay under siege. Ambassador Joseph Kennedy faced harsh public criticism for his appeasement of Hitler, as well as for his public assertions that Britain would be destroyed by the Nazis. But Jack Kennedy had his own ideas about England's response to Hitler's rise to power, and he developed them in his Harvard senior thesis. Published and promoted by Joseph Kennedy. Sr., Why England Slept became a national bestseller. In the book, author John F. Kennedy argued that it was the isolationist character of the British population as a whole, and not Britain's political leadership, that had led to Hitler's appeasement. Jack joined the Navy in the fall of 1941. Two years later, he became an American hero. As commander of motor torpedo boat PT 109, he had kept his men safe behind enemy lines after the boat was rammed and sunk by a Japanese vessel. The incident made him famous. In 1946, at the urging of his father, Kennedy parlayed his hero status into a Massachusetts Congressional seat. "We're going to sell Jack like soap flakes, " Joe Kennedy said. Kennedy and his Republican rival Richard M. Nixon met on Sept. 26, 1960 in a debate that changed the course of American politics. Vice President Nixon defended the Eisenhower administration against charges that its domestic programs had failed. Kennedy denied Nixon's assertions that he lacked the necessary experience. But it was not the content of the debate that made it a political milestone. It was the medium by which most Americans experienced the debate -- television. Before the debate began, public opinion polls showed a close race between the two men. But the television cameras changed that. An estimated 75 million viewers, at the time the largest television audience ever, saw a contrast between Nixon and Kennedy that had nothing to do with political positions. Nixon, who was recovering from a recent illness, appeared haggard and pale. He wore a five o'clock shadow and perspired. His makeup ran under the hot studio lights. Kennedy looked fit, relaxed and handsome. He exuded confidence and poise. The power of these televised images revealed itself in post-debate polls. Many radio listeners gave the edge to Nixon. Television viewers, however, overwhelmingly agreed that Kennedy had won. On inauguration day, Jan. 20, 1961, President Kennedy proclaimed to a national television audience that Americans would "pay any price, bear any burden, meet any hardship, support any friend, oppose any foe, to assure the survival and success of liberty." Although Theodore Roosevelt was the youngest man to serve as president, Kennedy was the youngest elected president at 43. He was also the youngest to die in office, at 46. While JFK was president, his brother Robert was U.S. Attorney General, and his youngest brother, Ted, was elected a U.S. Senator. This is the only time that three members of the same family have held such high government positions. JFK was also the only president to appoint a sibling to a cabinet post. JFK is the only president to have won a Pulitzer Prize, for his collective biography, Profiles in Courage. On May 3, 1963, television news programs brought images of racial violence into living rooms across America. Viewers watched as blacks protesting segregation in Birmingham, Ala., were attacked with clubs, dogs, and high-pressure fire hoses by Birmingham police. Kennedy, who had shown lukewarm support for civil rights legislation, was forced into action. The next month, he announced a comprehensive package of civil rights legislation in a nationally televised address. We’ve compiled this post based on information from “JFK,” the documentary airing on PBS. 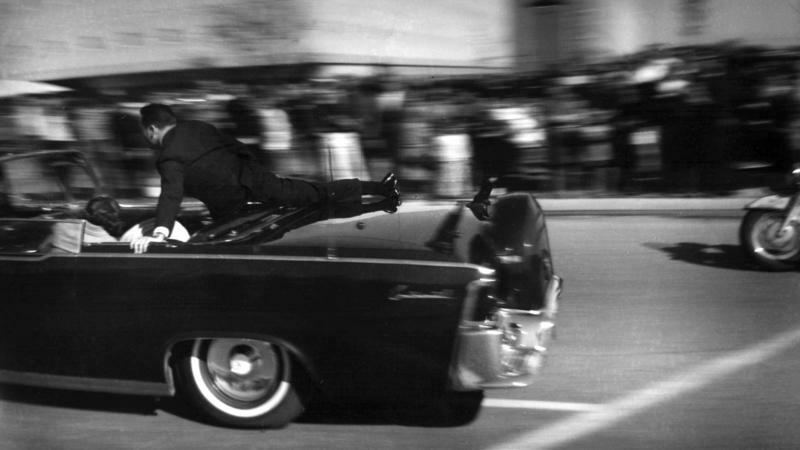 Nov. 22 will mark the 50th anniversary of the assassination of President John F. Kennedy in Dallas, a moment that left an indelible mark on those who remember it. It also permanently changed the agency charged with protecting the president — the U.S. Secret Service. Looking back at the images of Kennedy, first lady Jackie Kennedy, Texas Gov. John Connally and his wife waving as they rode through the streets of Dallas in an open Lincoln, it all looks terribly innocent and naive.